During the spring vacation I experienced something as quintessentially Japanese as kimonos and samurai. 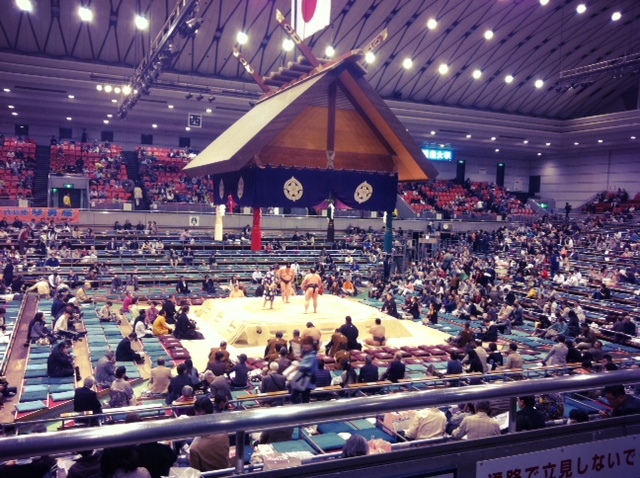 I paid a visit to Osaka’s Prefectural Gymnasium to see giant sumo wrestlers in action. Since coming to Japan it’s something that I thought I should do but it certainly wasn’t high on the list. Watching obese men in nappies slap each other isn’t exactly my idea of Saturday night entertainment but now I realize that I had completely underestimated the sumo experience. I’d seen sumo on TV but the 2D version is nowhere near as exciting as actually being in the arena and experiencing the atmosphere of the crowd. On TV it’s hard to imagine the sheer size of these gargantuan sportsmen. Seeing them up close makes you realize the intense training they have to endure to keep their bodies in tip-top condition. Before going to sumo I asked my co-workers if they’d ever been to a tournament and to my surprise none of them had. They found it really amusing and some even laughed hysterically when they found out I was going. I guess it’s sort of like the Highland Games and caber tossing in Scotland. Ashamedly, as a Scottish person, I don’t even know what a caber is let alone where to toss it. I’ve never been to the Highland Games and it just seems to me like something that’s there to entertain tourists – and to humor eccentric Braveheart type Scots. Perhaps sumo is viewed in a similar way in Japan. It was a bit of effort trying to find the venue but no sooner had we asked an information guide for directions when a group of sumos appeared on the other side of the crossroads. It was quite a surreal sight. Each were dressed in yukata and carried small toiletry bags, I assume they were heading to Osaka’s hot spring district to relax after a day of intense battle. When we arrived at the venue we were greeted by crowds of people lined up outside the arena – waiting with cameras at the ready to catch a glimpse of their favorite Sumo-San. It was comparable to those red carpet Hollywood events that you see during the Oscars or other star-studded event. We visited on the penultimate day of the tournament but as I have nothing to compare it to I’m not sure if that had any influence on the atmosphere of the crowd. I was really surprised when we were able to breeze past the crowds. I’d expected to queue all day feeling awkward at not knowing how to act and what social protocols I should follow. 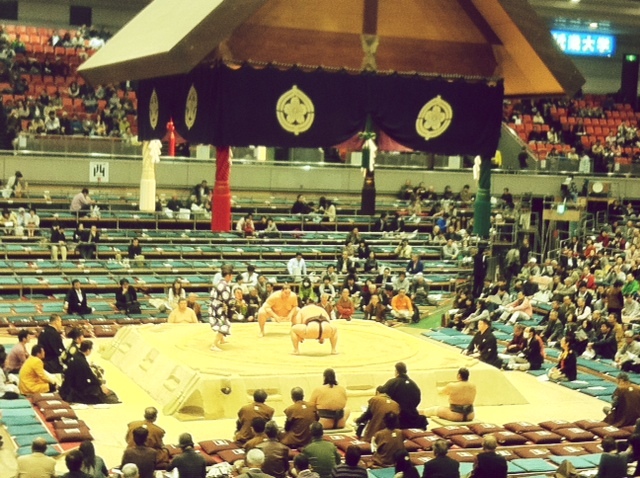 Which is the thing that struck me the most about my sumo experience, although steeped in tradition and ritual, sumo was one of the most relaxed environments I’ve experienced in Japan. Not bound to sit through the acts until the break, you can move around freely. You’re even permitted to leave the arena if you’re looking to go out for some lunch or fresh air. I was also amazed that the sumo wrestlers and audience walk through the same areas – rubbing shoulders with the behemoth giants. Even though we were sat at the very back I still felt like we had a pretty good view. That might have had something to do with the Sumo-Sans being so big. Tickets for the tournament start from 3,600 yen (around £23) which I think is a fair price for a whole day of sumo action. A usual sumo tournament day is from 8am-6pm but the morning is generally quiet as this is when the less experienced sumos perform. 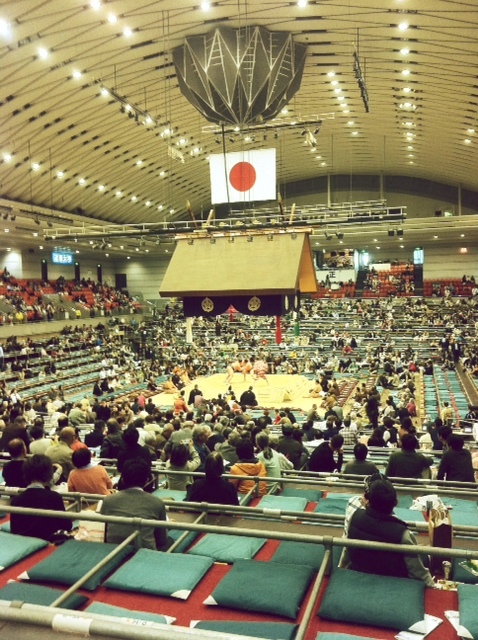 As the day progresses the arena fills up as more accomplished sumo wrestlers take to the ring leading up to the top ranking sumos at the very end of the day. 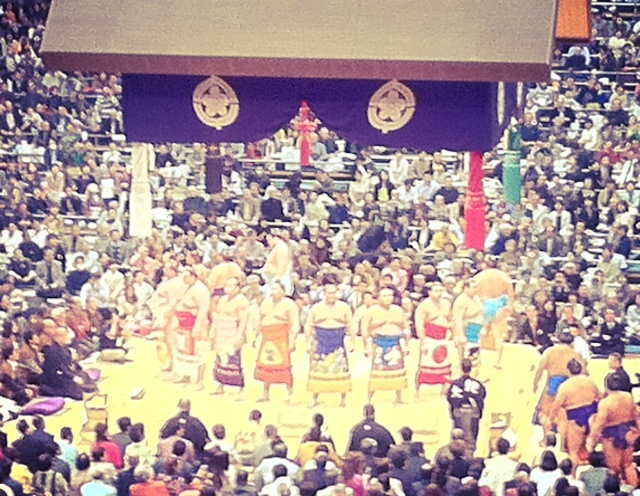 The top sumo-wrestlers performing the opening ceremony for their upcoming matches. I really surprised myself with how much I enjoyed the “sumo experience”, I’d definitely love to go again. Next time I’ll take more snacks and perhaps try to book seats a little closer to the action.